I wish I was the kind of person who started out on one task, finished it, and moved on to the next. I am not. I seem to be working on approximately nine at any given time. I wanted to share of a few I have actually finished. I began this project Labor Day weekend. I finished one chair. The other was not completed until early Oct :) You can see the before pics in my Labor Day Makeover post. (This is only for the brave). I am, though, pretty happy with the outcome. 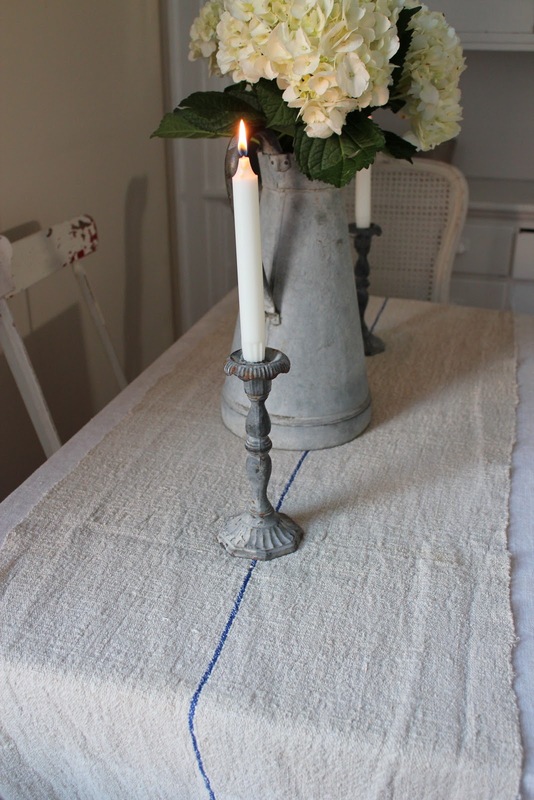 I made and sold a few of these white linen pillow shams in my Etsy store and really like the feel of them. The edges are unfinished. I think that this roughness offsets the sweetness of the ruffle. I have been meaning to make a blue grain sack body pillow for a while now. I waited until I found the right sack. And this coverlet is a favorite of mine. I like how the pillows do not match but coordinate. It has a tight weave and a beautiful red stripe pattern. But the best part of this is the bottom where the stripes do not match up. It is just how it was made over 80 years ago. 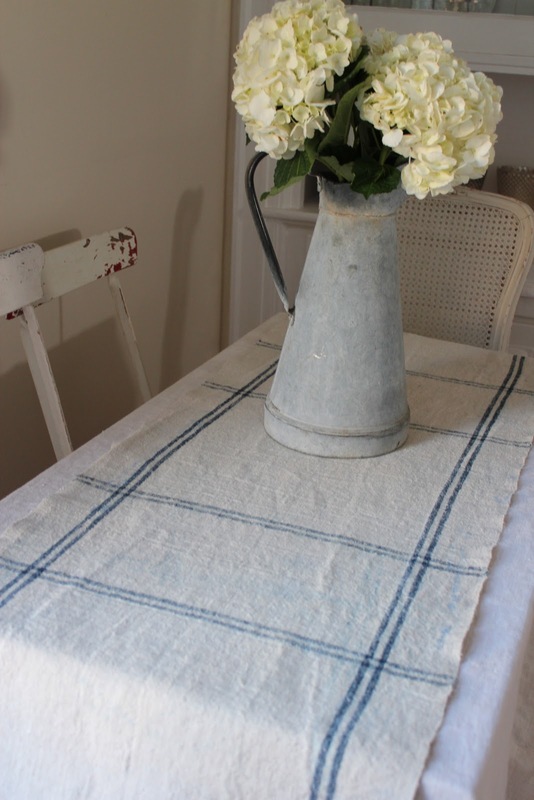 The fabric I used to make this runner is unique in that it s a windowpane pattern. I love it! The blue must have offset when it was made, which I also really like. I think it adds character. And this runner is pretty simply but would adorn any French country table well. Looks great Michele!! Love it all! The shams are my favorite!!! LOVE.... found you over at Burlap Luxe and glad I did the chairs are amazing great job!!!! Thanks for stopping by my blog. Unfortunately, I will be packing up the store and moving everything this weekend. I am moving it to San Mateo and hope to be open by weekend after Thanksgiving. Hope to see you then? I'll make sure all the info is posted as soon as I have a confirmed date for opening. Love your style girl! Gorgeous things!!! Those chairs are so fabulous, you did an amazing job on them!!! 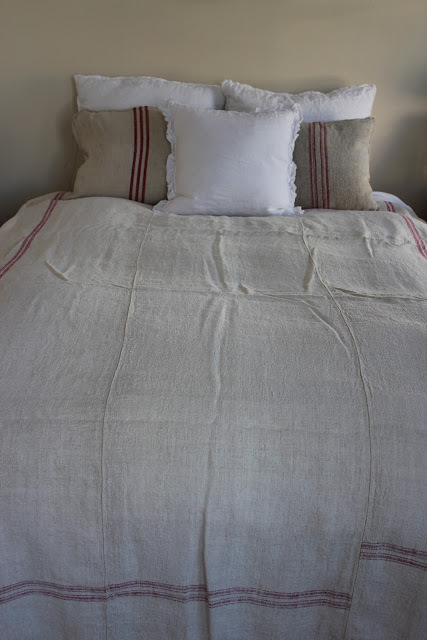 I'm so sad that I missed out on that vintage grain sack coverlet, so wonderful! thanks for your kind remarks Ladies! always inspirational to hear from you! I love your chair transformations, they look beautiful! If you don't mind me asking, what type of paint did you use for them? I have a few cane chairs that I want to paint but I am hesitant because I don't want to mess them up.